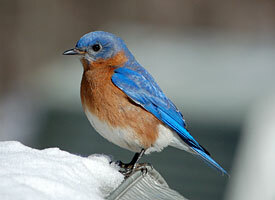 True to its name, the bluebird is mostly royal blue, the breast a reddish brown, the belly a creamy white. Their song can be described as a melodious warble. Part of the thrush family, the bluebird is related to the American Robin and Wood Thrush (all plentiful around here). The bluebird is a peaceful, almost passive bird, susceptible to more aggressive species. Back in the early 1900’s a few pairs of English House Sparrows were released in Central Park (New York). These aggressive birds took over many of the natural cavity nesting areas of the bluebird, threatening the bluebird’s future. A popular groundswell of support for the bluebird resulted in large numbers of wooden bluebird nesting boxes being installed, coming to the bluebird’s rescue. In 2006, I installed 27 bluebird boxes and tracked them that year on a weekly basis. Over 137 bluebird eggs were laid in 40 sets of nests. We had 49 bluebird fledglings make it out of the nests. In addition, there were 11 Tree Swallow eggs laid with 4 Tree Swallow fledglings. The other part of the story is that many of the eggs and at least some of the hatchlings were eaten or killed by other birds or snakes. At least two of the nests were abandoned by the parents after bad rain/wind storms. A 7 egg Tree Swallow nest was attacked by other birds, killing the babies leaving one of the parents on top of the nest, headless. There is a cruel reality in nature that we forget when we are separated from it. The good news is that we are blessed with many bluebirds and tree swallows. You cannot go anywhere on this farm without seeing the bluebirds, all four seasons of the year. I have installed winter community-nesting boxes for their use. This dark bluish-purple-backed and white-chested bird is known for its graceful swooping flight in chase of insects. As fierce protectors of their nests they differ dramatically from the bluebird. Their song is described as a cheerful twitter. They travel away from here in the winter and gather in the south in large flocks. 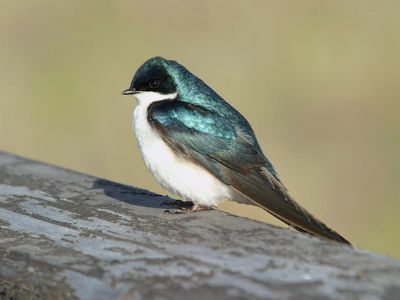 The tree swallow is related to the Barn Swallow a rainbow-colored swallow which nests in open shelf type nests and the Purple Martin which is similar in color, but prefers community bird houses.